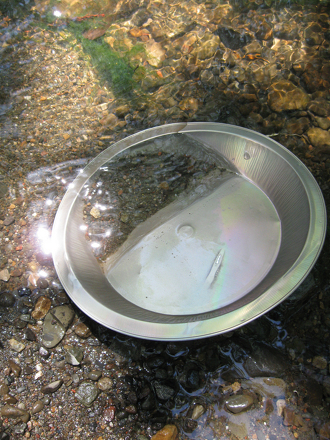 If you're looking for a fun, unique summer adventure, why not try panning for gold in your own backyard? Make history come alive for your kids as they learn what it was like to be a prospector during the California Gold Rush. While you're not guaranteed to find any real gold, it's still a fun way to spend some time outdoors while getting a hands-on lesson in California history. See the end of this activity for a few quick facts about this famous gold rush. 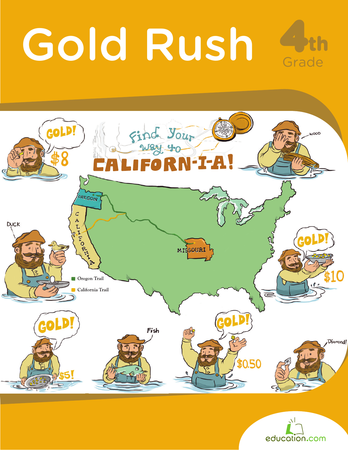 Before making the trip to the creek, read about the California Gold Rush in the history book or online with your child. What caused it, and why does he think it attracted so many people? What does he think it was like to be a gold miner? Travel to your chosen creek and find a good spot for panning. Have your child sit down. Invite him to fill the pan 3/4 full of gravel from the stream, then submerge it deep enough so it's just under the surface of the water. Give the pan several vigorous shakes back and forth and from side to side, but not so vigorous that the material washes out of the pan. Now have him switch to a gentler circular movement, so the material starts revolving in a circle. This process will cause most of the dirt and clay to dissolve and wash out of the pan. If roots and moss surface, work them over your pan with your fingers to dissolve any lumps. Pick out the larger rocks after making sure they're washed clean. Repeat steps 3 and 4 until there are only about two cups of heavier material left in your pan. This material is usually called "black sand" or "concentrate." Now ask him to raise the pan completely out of the stream, leaving about an inch of water in the bottom. Have him tilt the pan slightly toward himself and swirl the water slowly in a circular motion to check the pan for nuggets and pieces that he can easily pick out by hand. If you have a plastic bowl, you can use a magnet to pull away the magnetic black sand pieces. A small squeeze bottle of water can help go through the black sand as well. He should be able to see the gold now if he has any. Don't be sad if it's only a few little pieces. Those pieces add up! Did You Know? The California Gold Rush began on January 24, 1848, after James W. Marshall discovered gold at Sutter's Mill in Coloma, California, not far from Sacramento, the state's capital. Over the course of the 7-year period, about 300,000 people flocked to California in the hope of striking it rich. Early gold seekers were called forty-niners after the year they arrived, 1849. The Gold Rush helped make San Francisco an important city. Before this period, San Francisco was just a small settlement, but as large numbers of gold seekers began arriving in California, San Francisco quickly expanded into a boomtown.